The ExoMars lander, Schiaparelli, is performing its six-minute descent towards Mars. An entry, descent and landing demonstrator module, Schiaparelli will enter the atmosphere of the red planet, traveling at a speed of about 21,000kph (13,000mph). After its descent, the module is set to land near the Martian equator and deliver a science package that will operate on the surface of Mars for two to four ‘sols’ (Martian days). 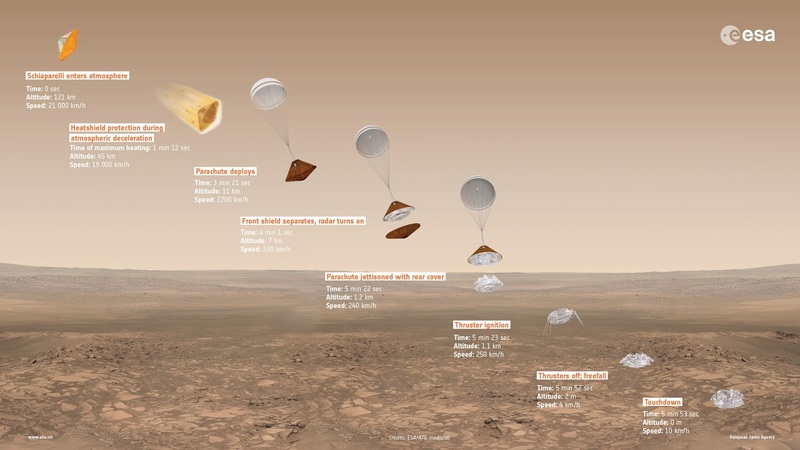 The ExoMars 2016 mission is a joint project of the European Space Agency and Russia’s Roscosmos.